This 1000-piece jigsaw is designed by Nicky Boehme and measures 51 cm x 69 cm. 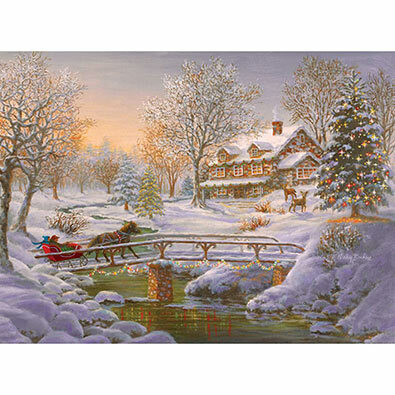 A horse-drawn sled crosses a bridge over a river in a winter wonderland, leading to a snow-covered house decorated for Christmas. Available in two-piece counts. This 1000 piece jigsaw is designed by Nicky Boehme and measures 51cm x 69cm. Available in two sizes. This 1000 piece jigsaw is designed by Nicky Boehme and measures 51 cm x 69 cm. This puzzle depicts a beautiful farm, populated by roosters and horses. Available in two-piece counts. Picturesque Covered Bridge is a 1000 piece jigsaw puzzle designed by artist Nicky Boehme. An old wisteria tree in bloom grows on the side of the river next to the covered bridge built in 1873. A white steeple church welcomes visitors to the quiet hamlet on the other side of the gentle river. Available in two-piece counts.